Tenorshare Video Converter for Mac 2.0.0.0 Free Download - Tenorshare Video Converter for Mac can convert all popular video files on Mac. Last Updated: 6/9/2013 | File Size: 8644 KB | Price: $29.95 | Downloads: 116 | Developer: Tenorshare Co.,Ltd. Tenorshare Video Converter for Mac is a professional and efficient software tool that can convert video &amp; audio to hundreds of popular formats on Mac with 30X faster speed and zero quality loss. This Mac video converter software converts between all popular standard and high definition videos, such as: AVI, MP4, MPG, WMV, MOV, MTS, M2TS, TS, AVCHD, HD MOV, HD MP4, HD MPEG, HD MKV, HD M4V, etc. It also extract audios from videos, and convert audio to other popular formats like M4A, MP3, M4R, FLAC, APE, WAV, AC3, AIFF etc. 1. Convert all popular video &amp; audio formats on Mac without quality loss. 2. Enjoy media files on mobile devices such as iPad, PSP, Samsung Galaxy etc. anytime and anywhere. 3. 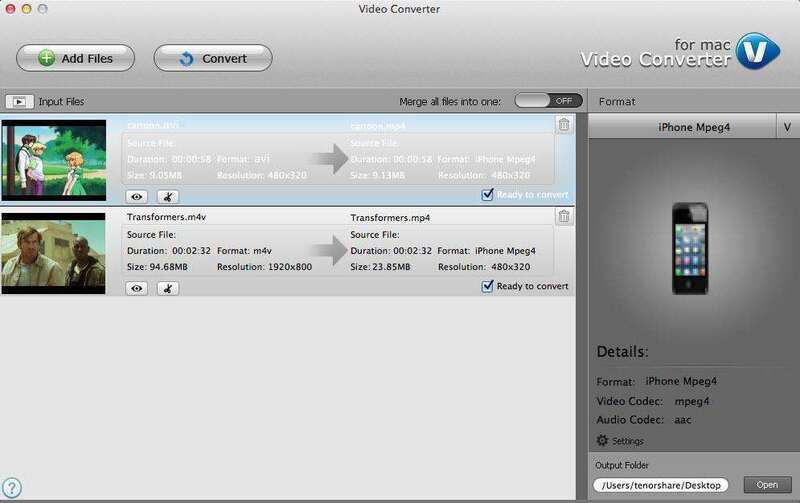 Convert video to an optimized format for QuickTime Player, iMovie. 4. Edit videos via cropping, clipping, merging, watermarking, etc. 6. Free technical support and full money-back guarantee. 7. Simple and easy-to-use interface. Statement: First, please download the orginal installation package by clicking the download link. Of course you may also download it from the publisher's website. Using Tenorshare Video Converter for Mac crack, key, patch, serial number, registration code, keygen is illegal. The download file hosted at publisher website. We do not provide any download link points to Rapidshare, Hotfile, Depositfiles, Mediafire, Filefactory, etc. or obtained from file sharing programs such as Limewire, Kazaa, Imesh, Ares, BearShare, BitTorrent, WinMX etc. Software piracy is theft. If you like Tenorshare Video Converter for Mac please buy it.